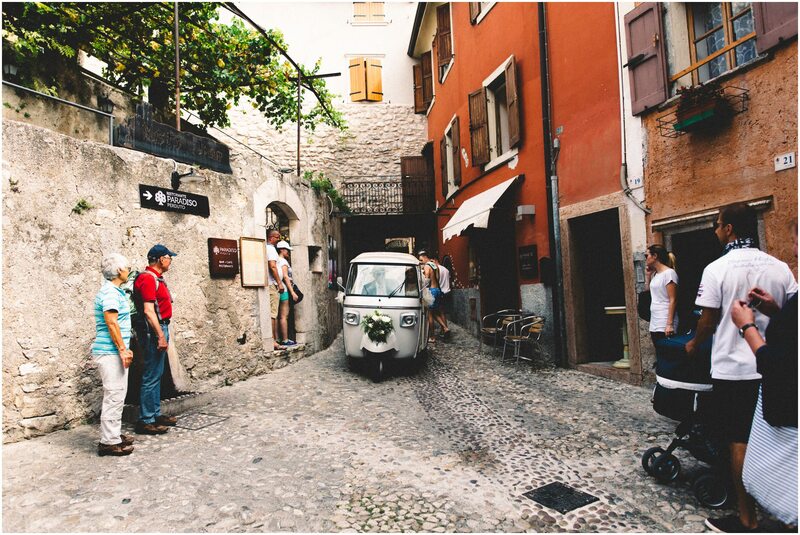 When Alex first asked us “Do you travel?” we could barely hide our excitement. 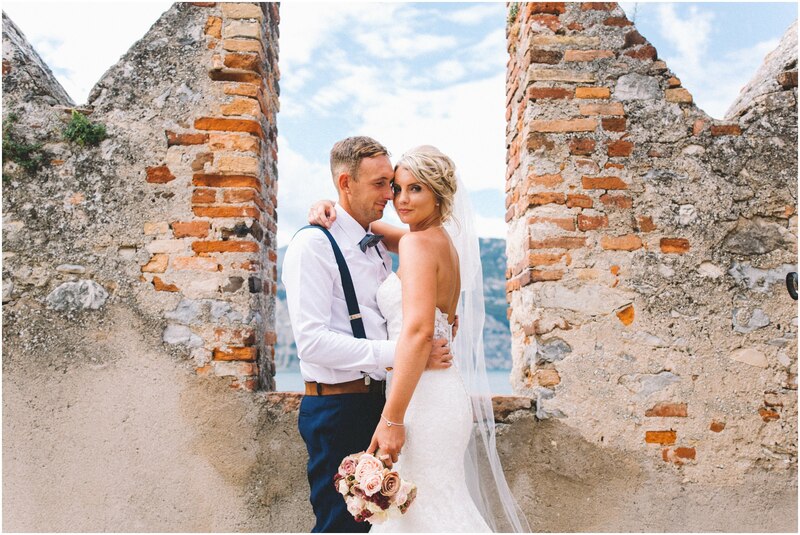 We hit it off with Alex & Paul from the word go, they are an amazing, cool, and super kind couple and when they invited us to Italy to shoot their wedding we were over the moon. 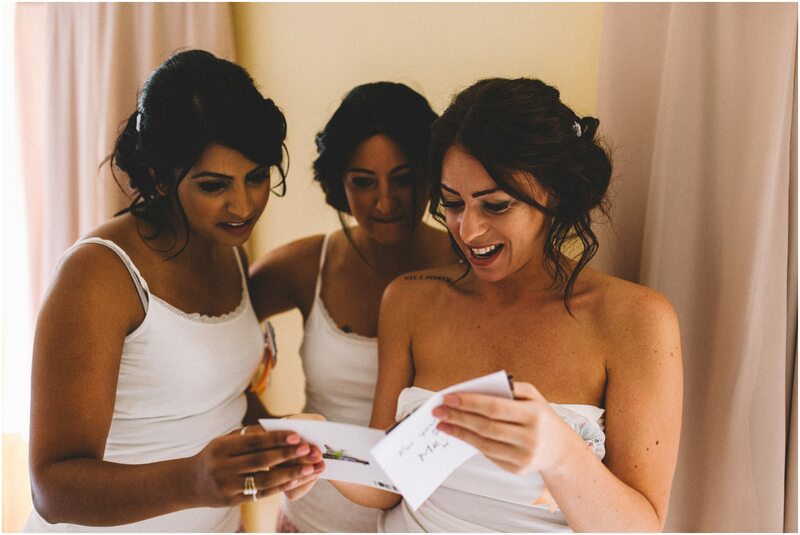 In the months building up to the wedding we would get excited messages from Alex or bump into them and talk about how we all couldn’t wait for their special day, and then before we knew it it arrived. 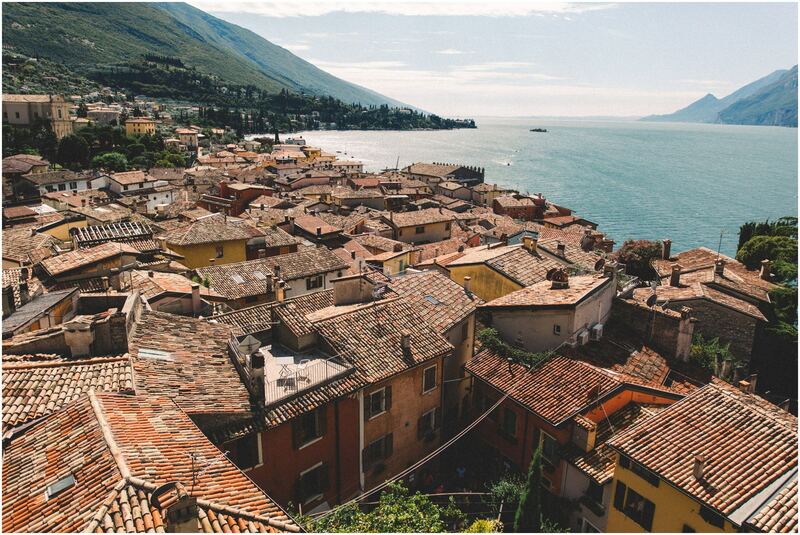 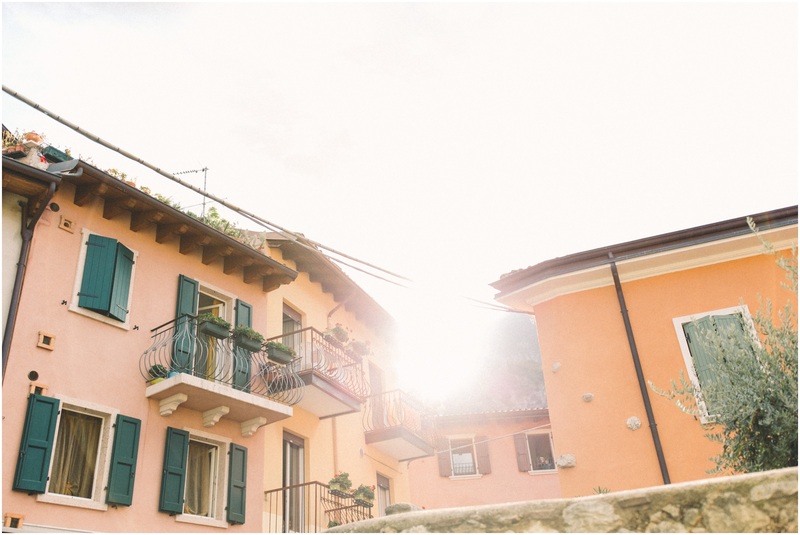 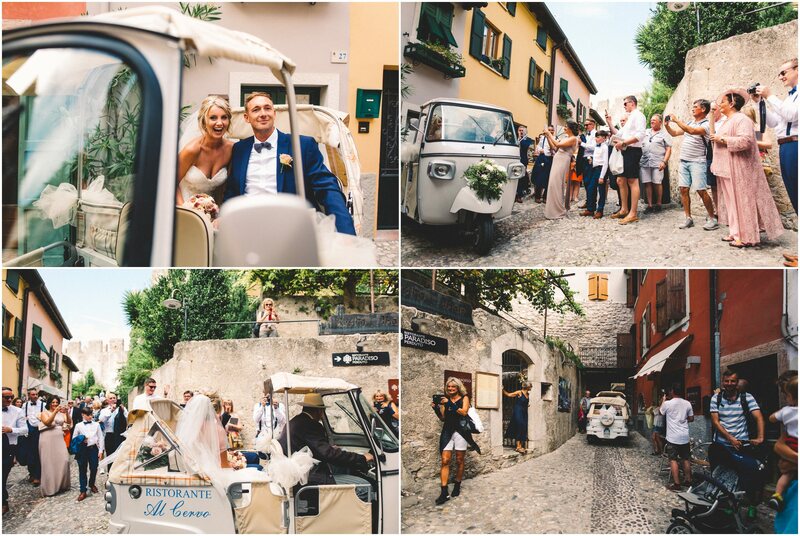 We arrived in Italy the day before the big day itself and were thrilled to bump into Alex & Paul on the bus into the beautiful little village of Malcesine, after squeals of excitement and a quick catch up we hugged and said our goodbyes until the morning. 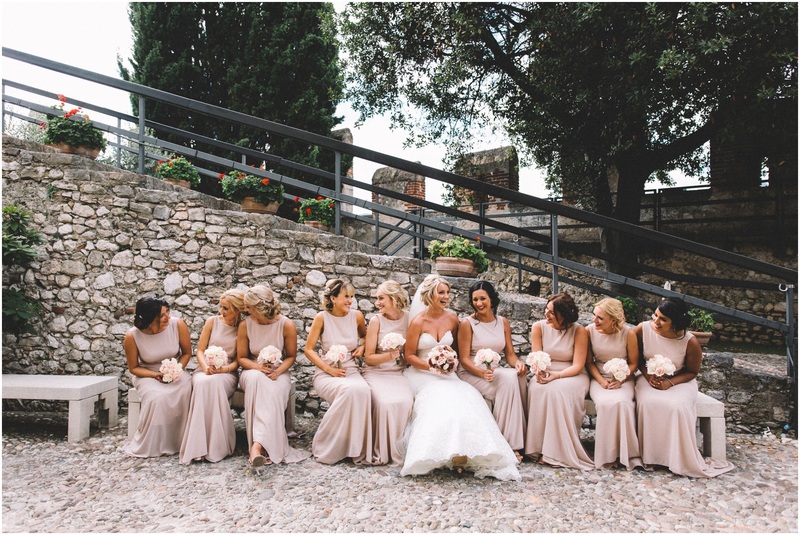 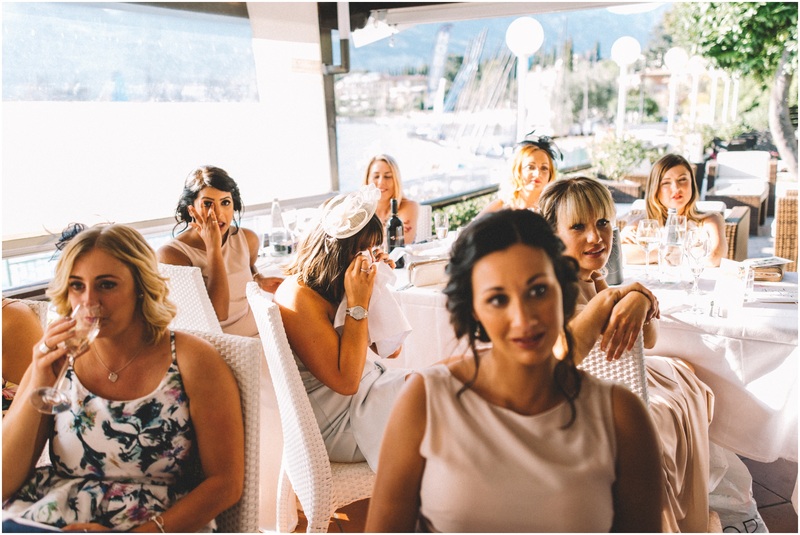 The wedding day began with a trip to the hairdressers in New Look Tiziana Malcesine with Alex and all nine of her amazing bridesmaids. 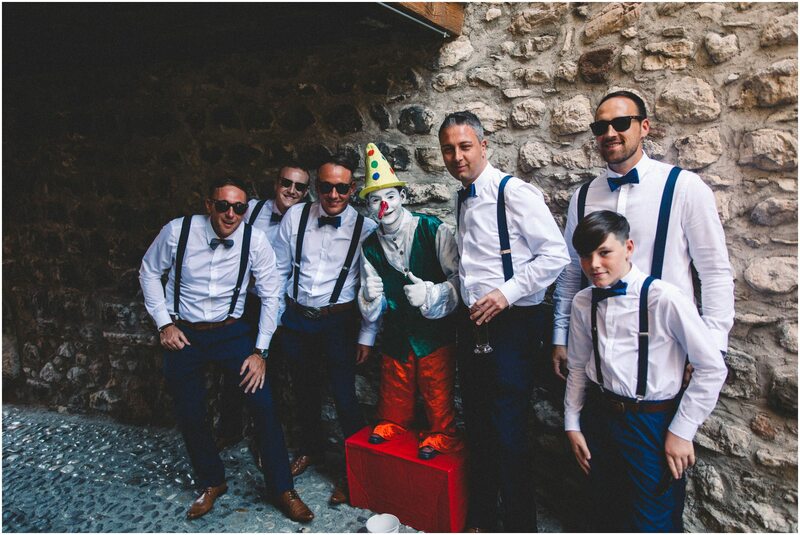 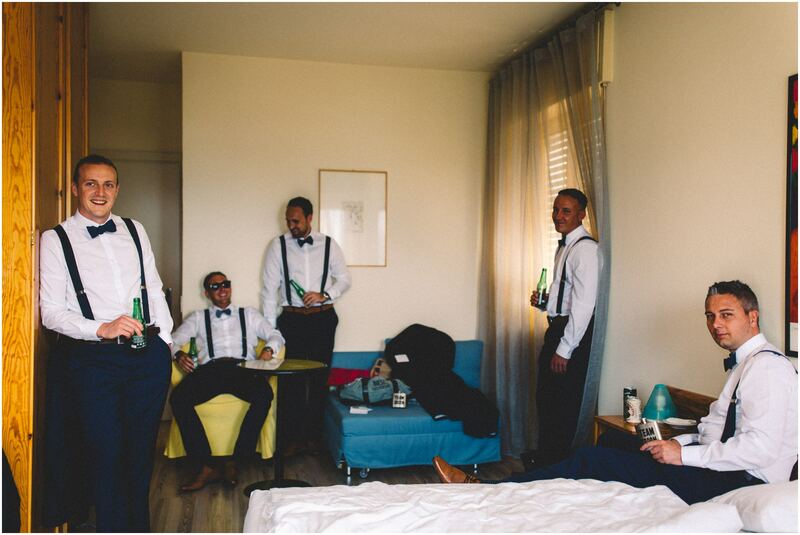 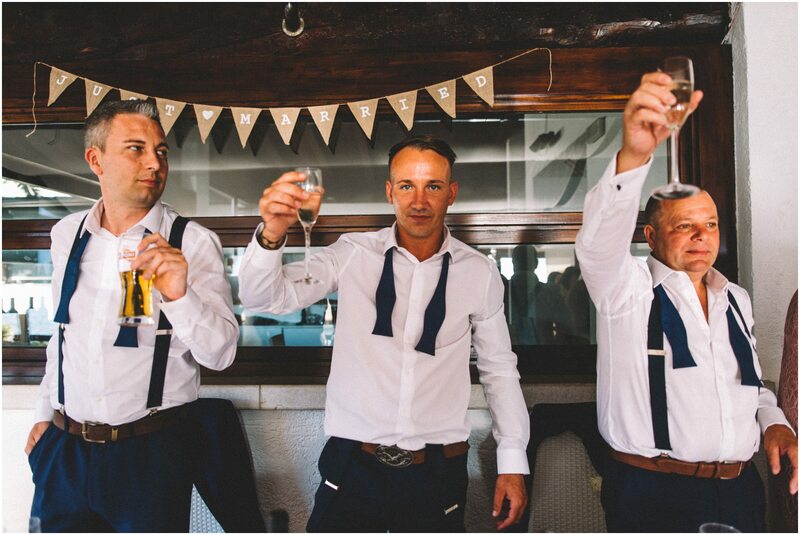 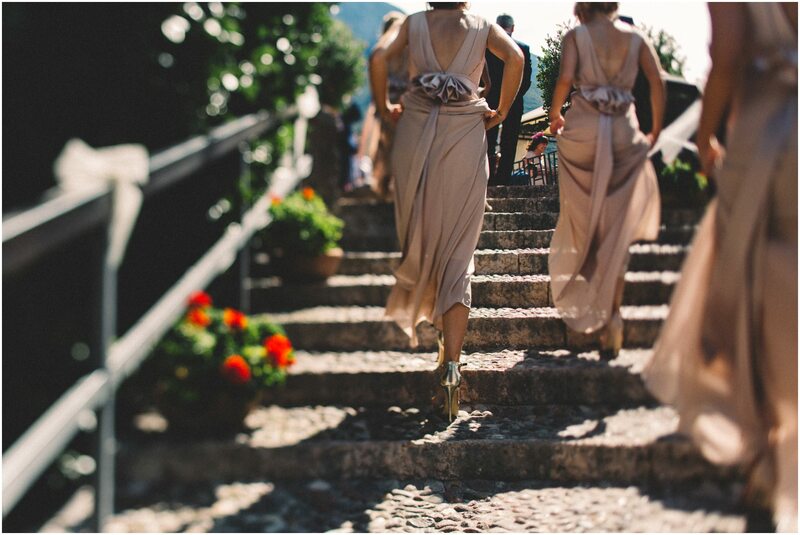 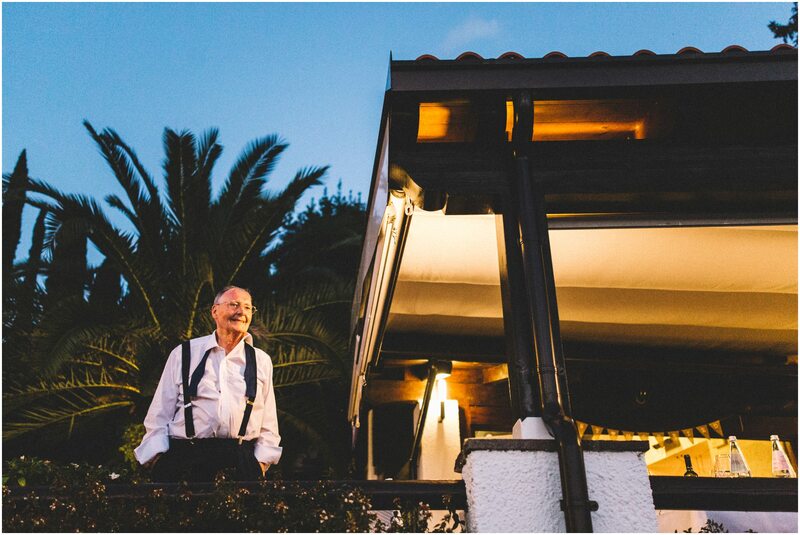 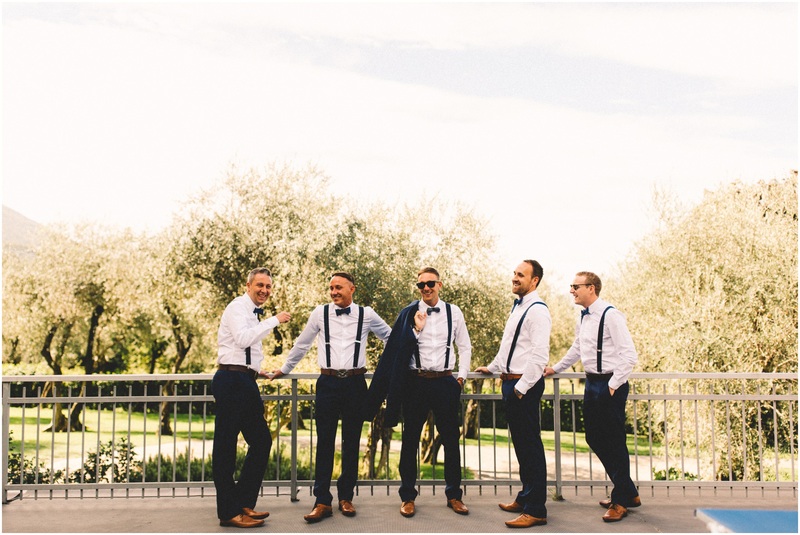 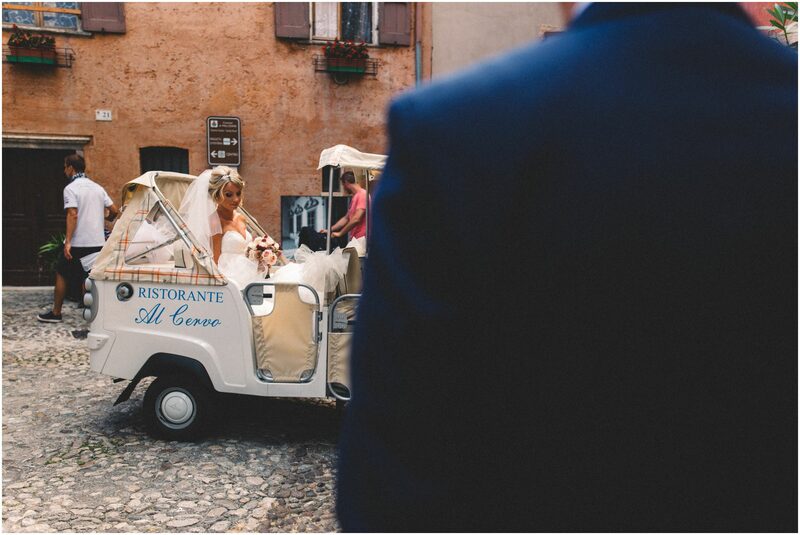 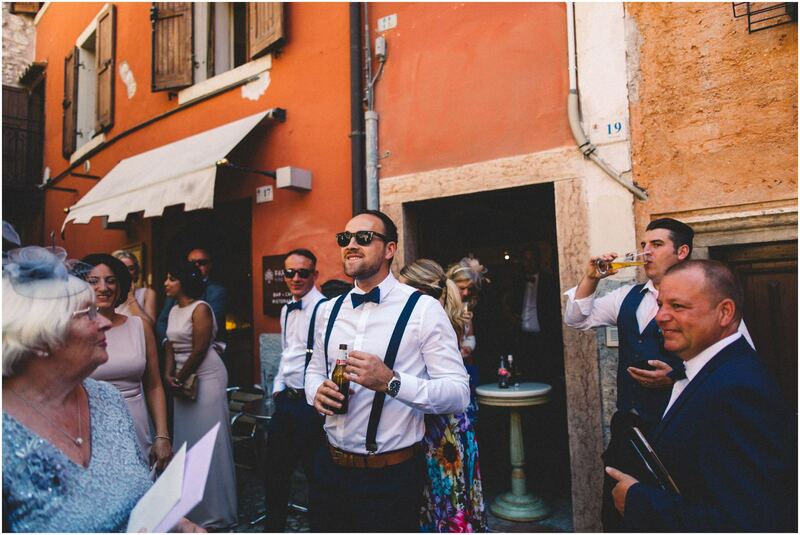 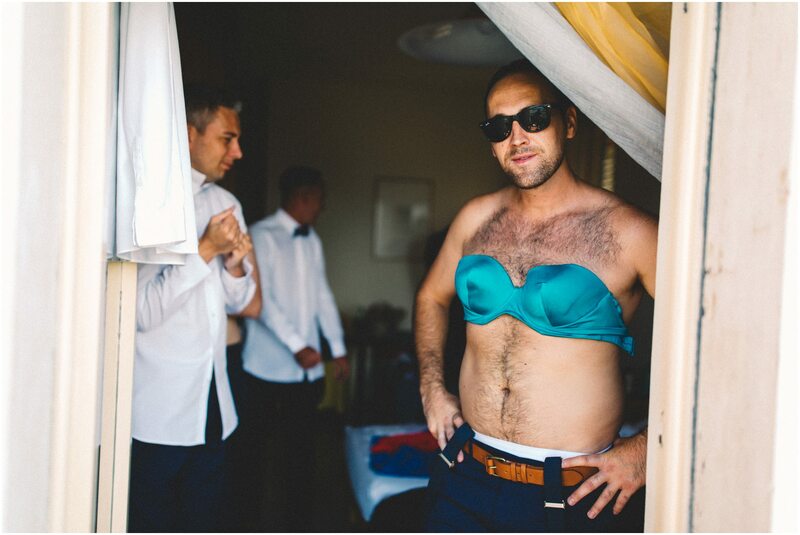 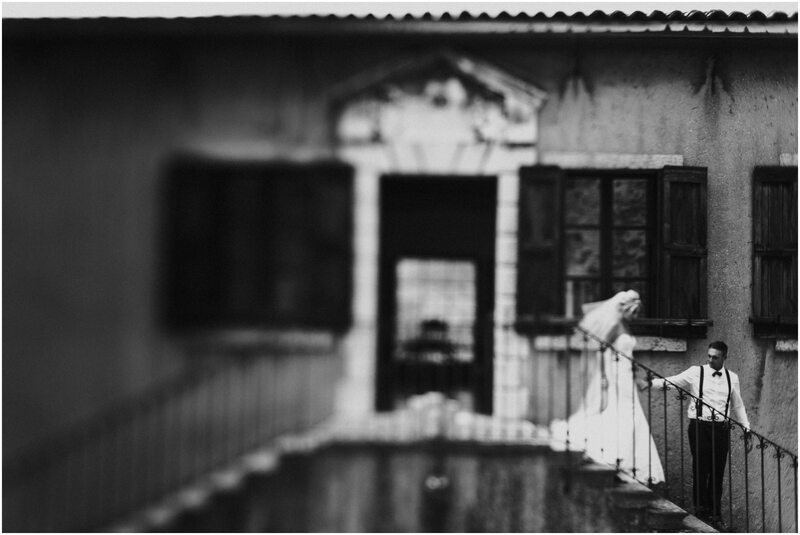 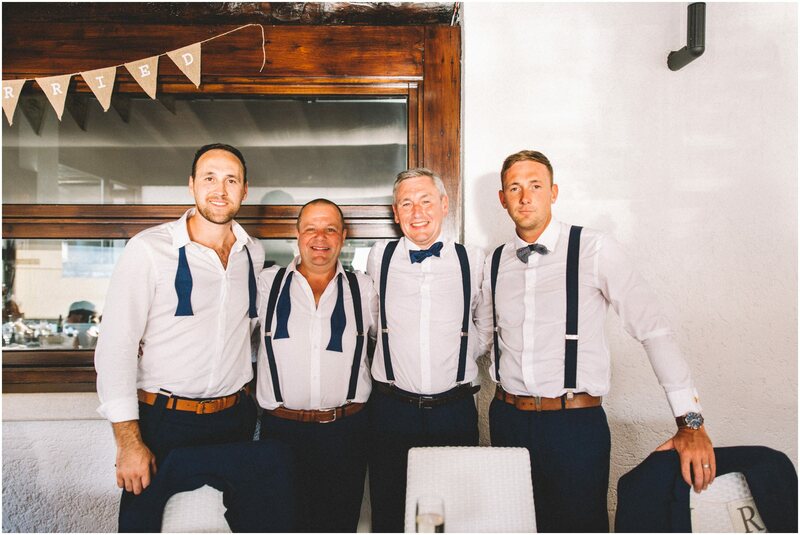 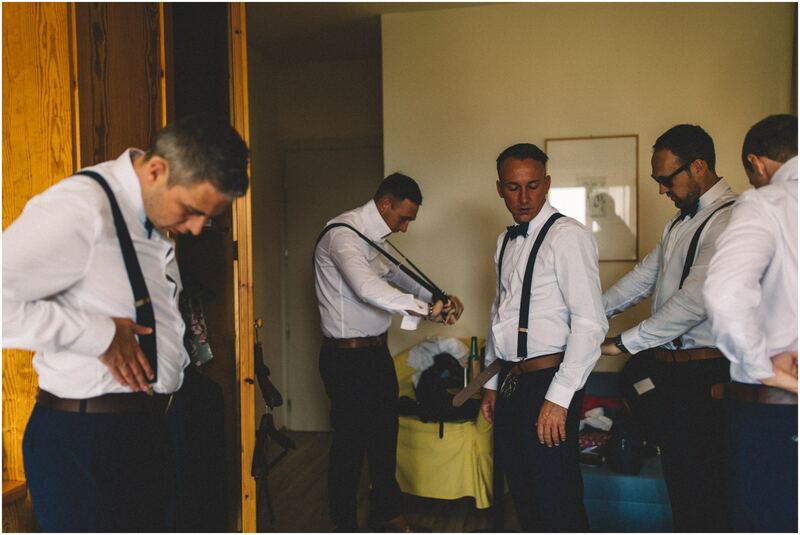 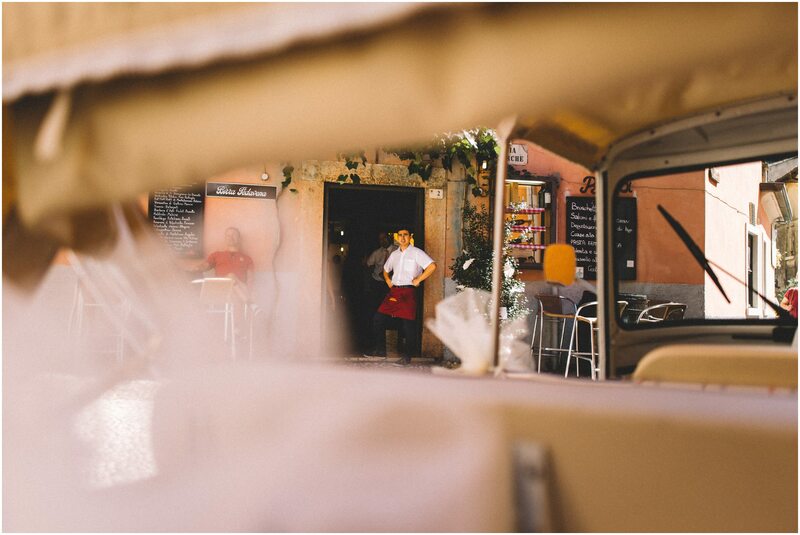 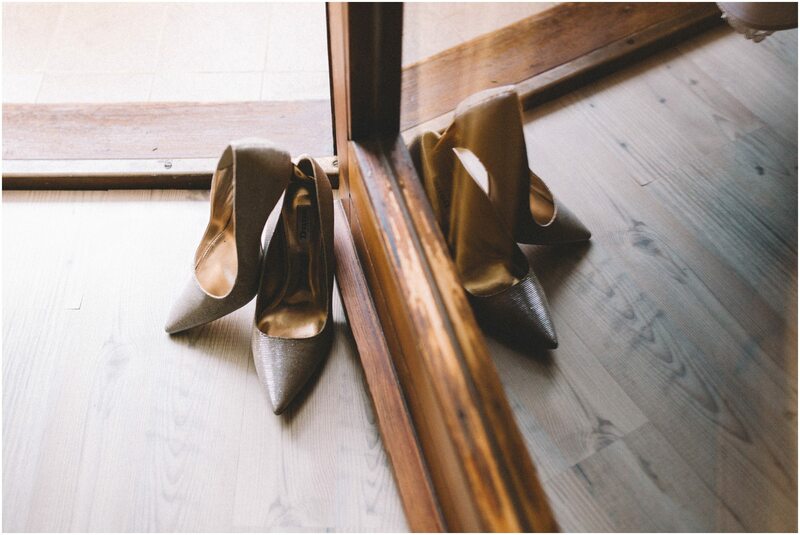 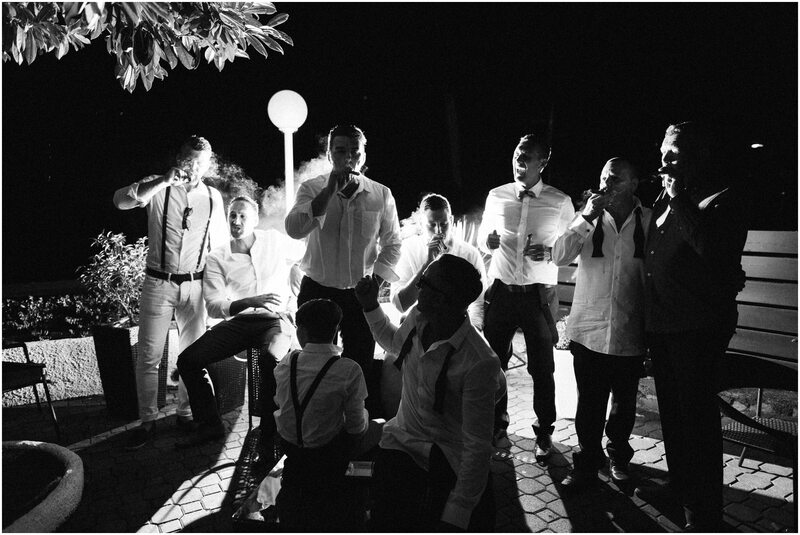 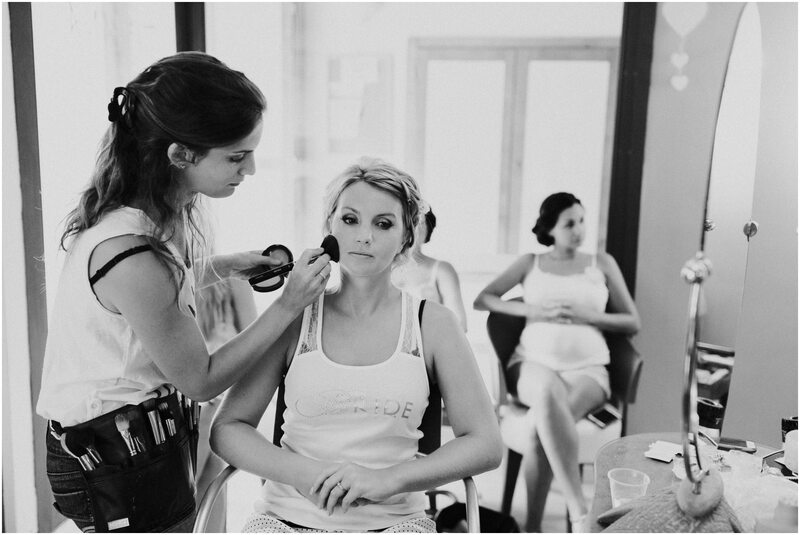 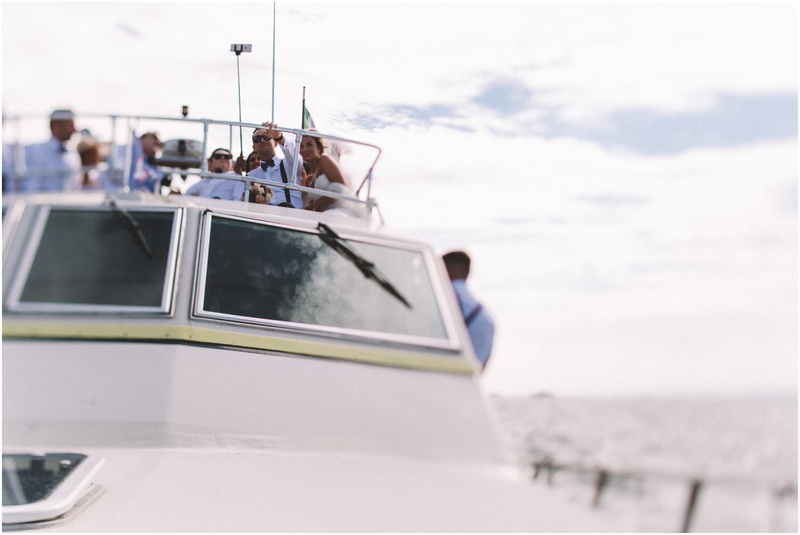 Once the finishing touches were made to the girls we headed to hotel Olivi to catch up with Paul and his groomsmen, they were all in good spirits and eager for the day ahead. 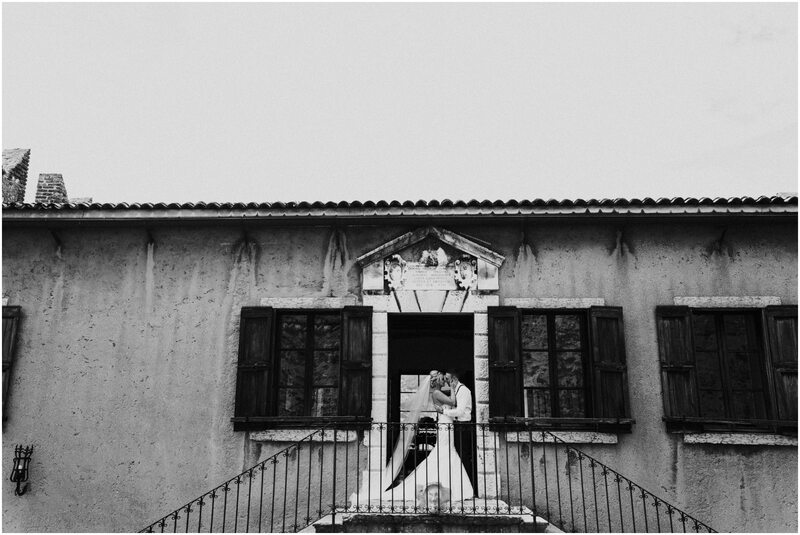 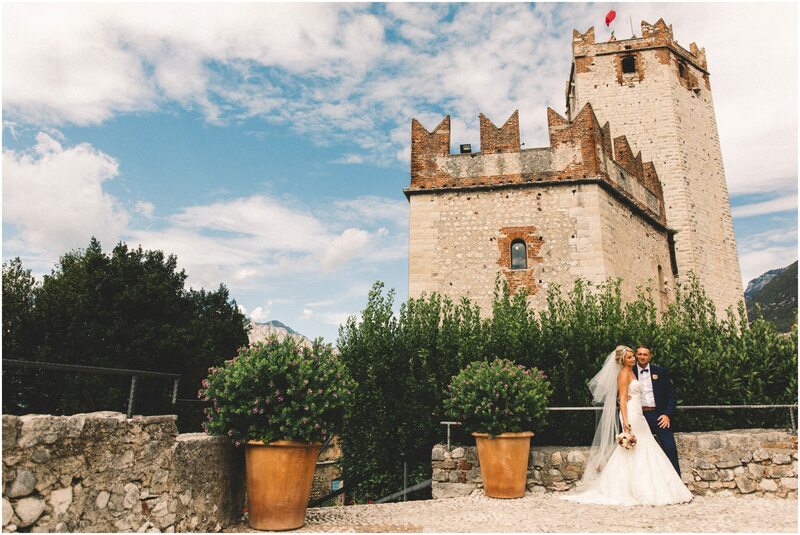 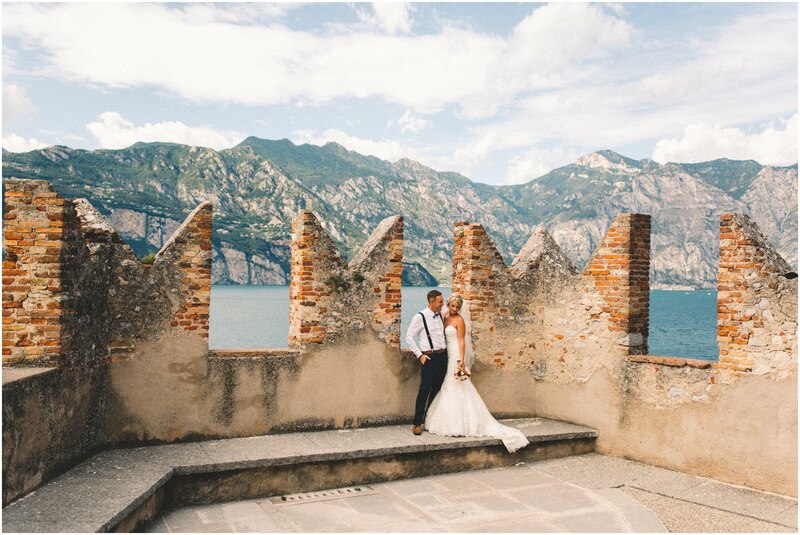 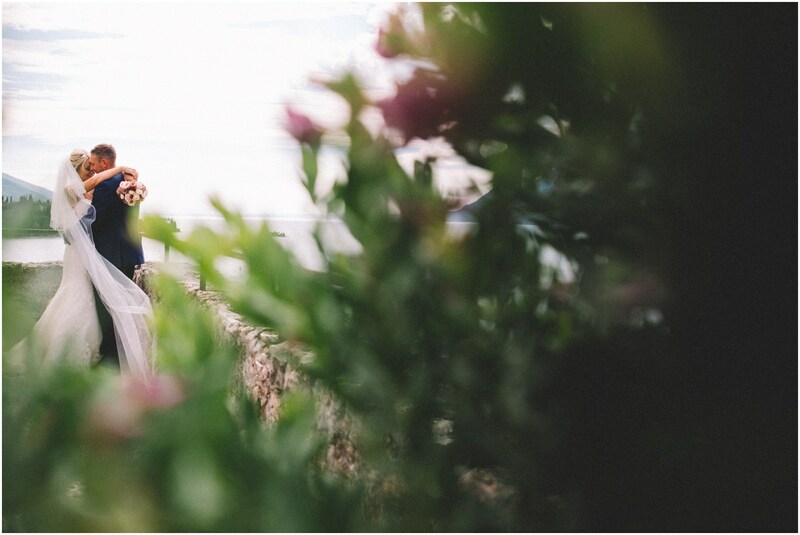 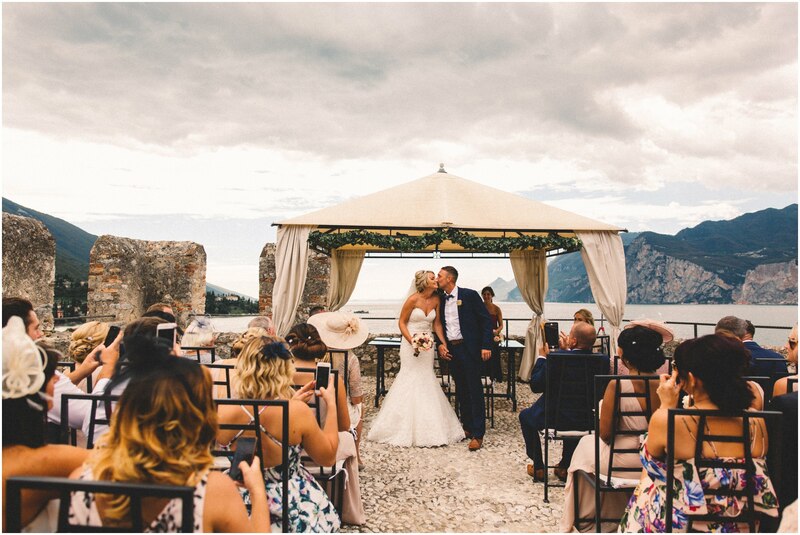 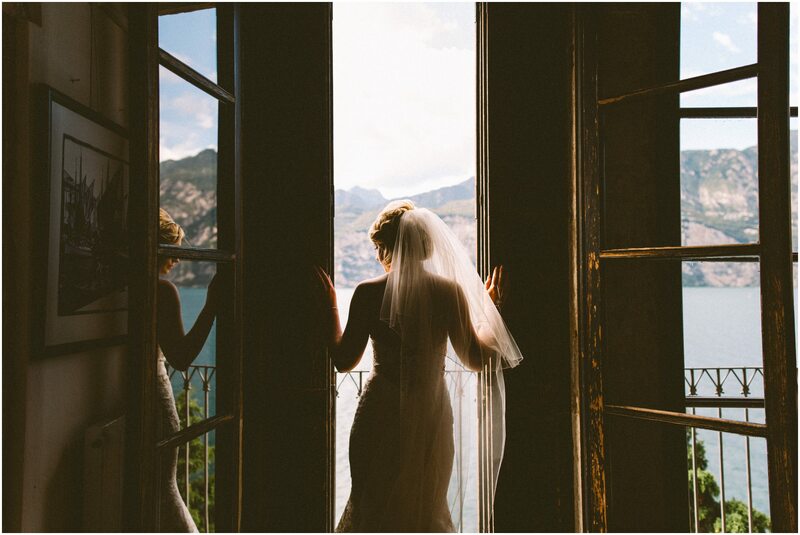 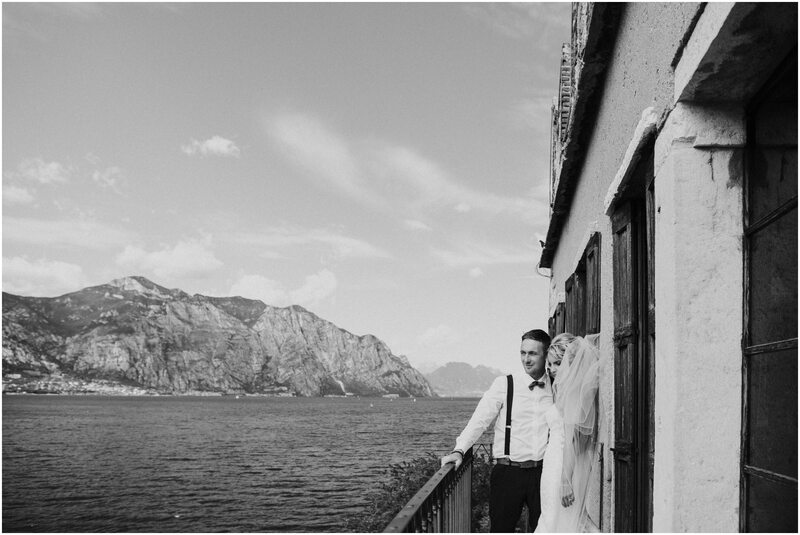 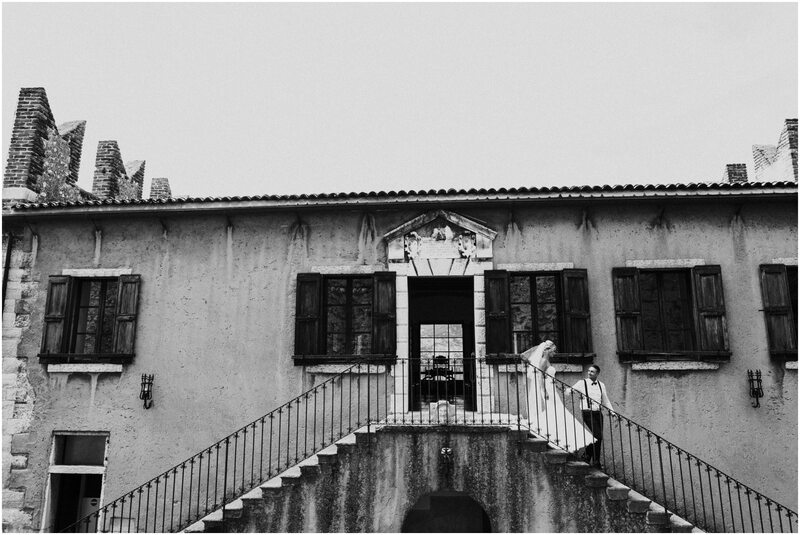 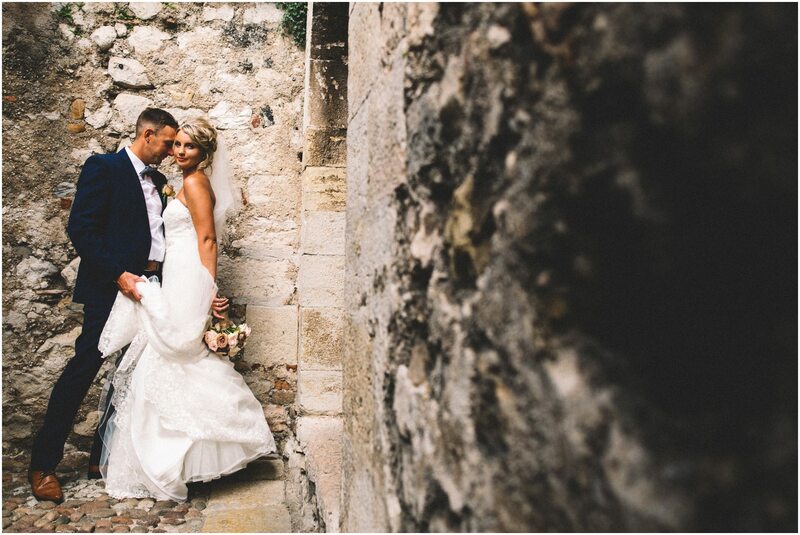 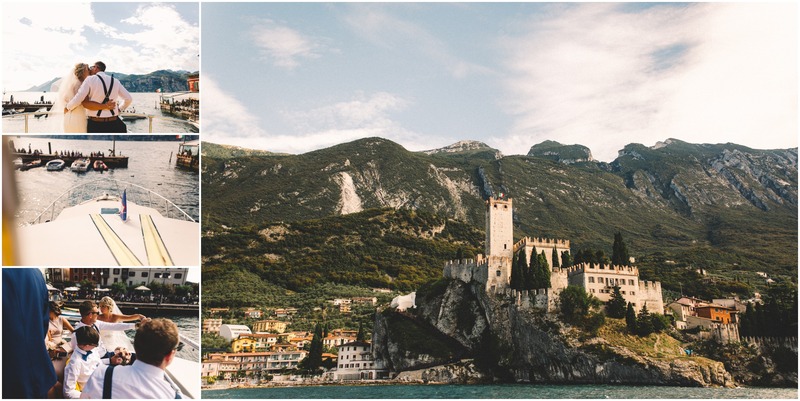 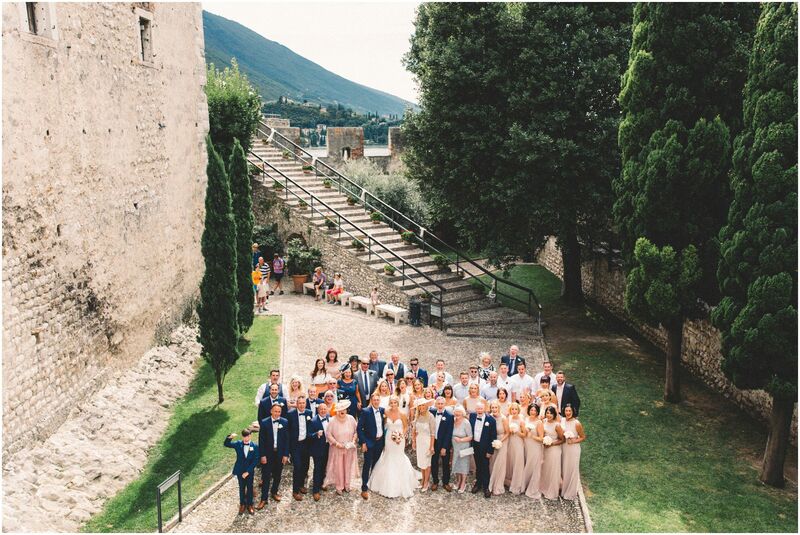 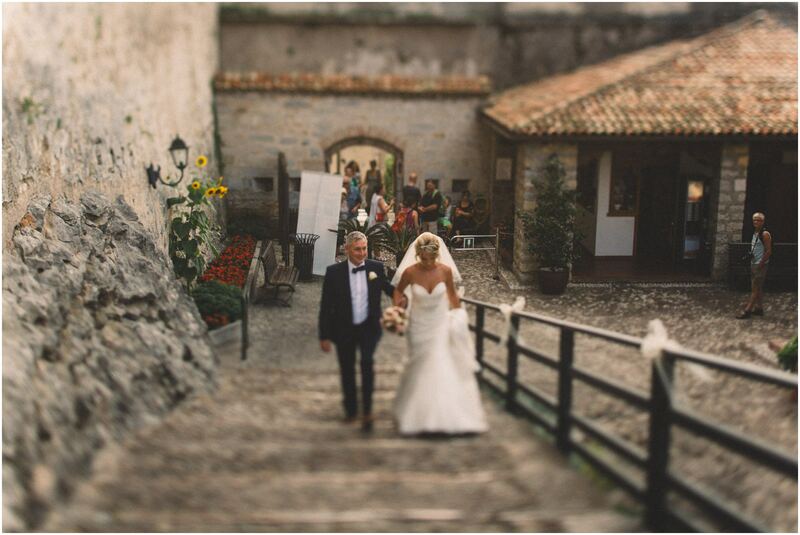 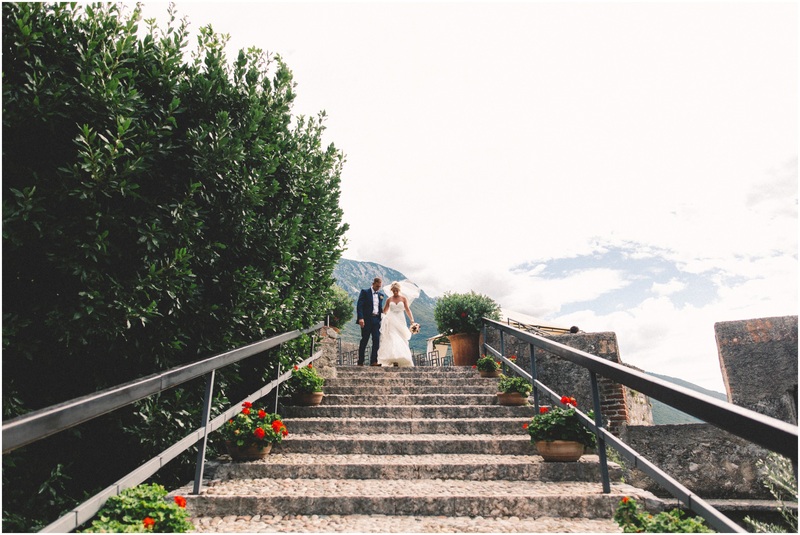 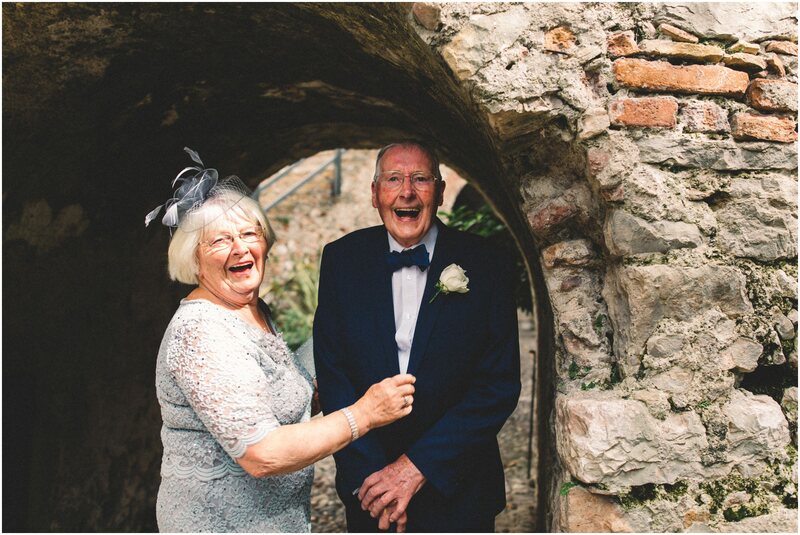 Alex and Paul said their vows to each other at Malcesine castle, it was even more beautiful than we had ever imagined and Alex blew us all away as she walked down the open air aisle with her proud Dad. 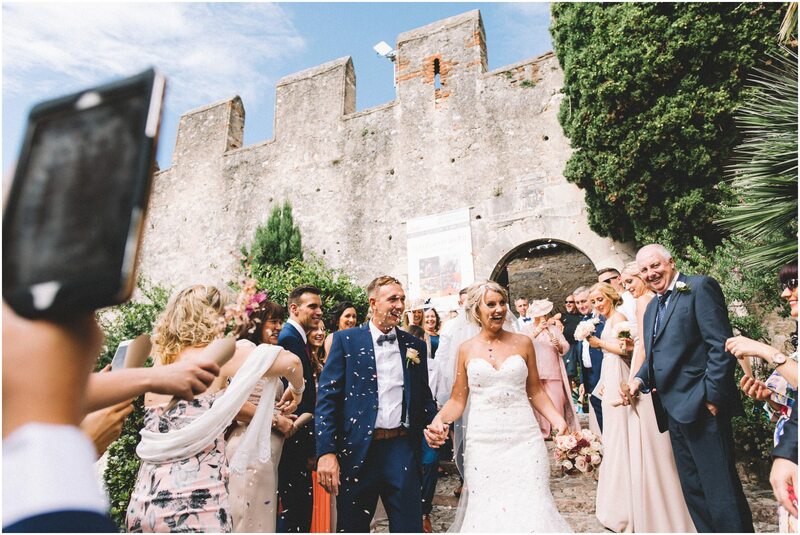 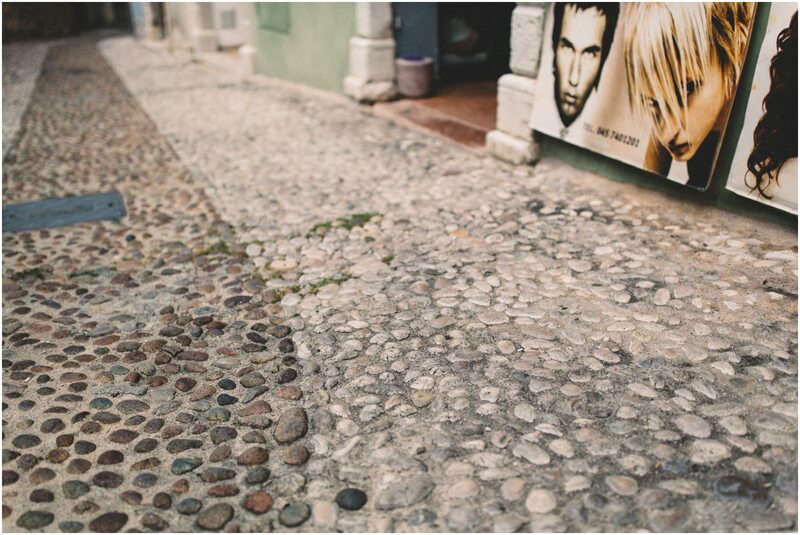 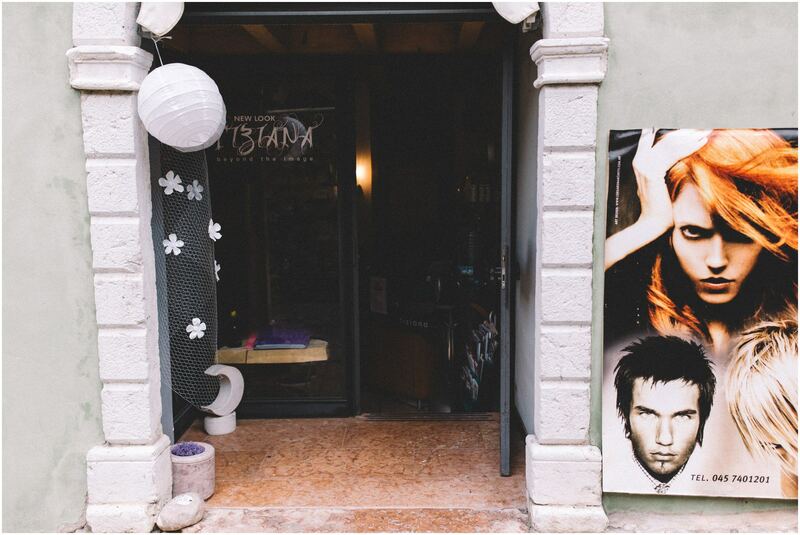 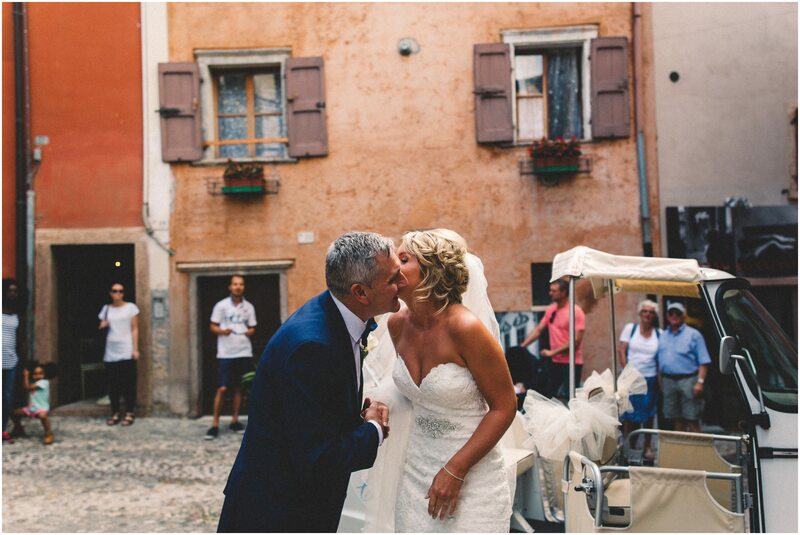 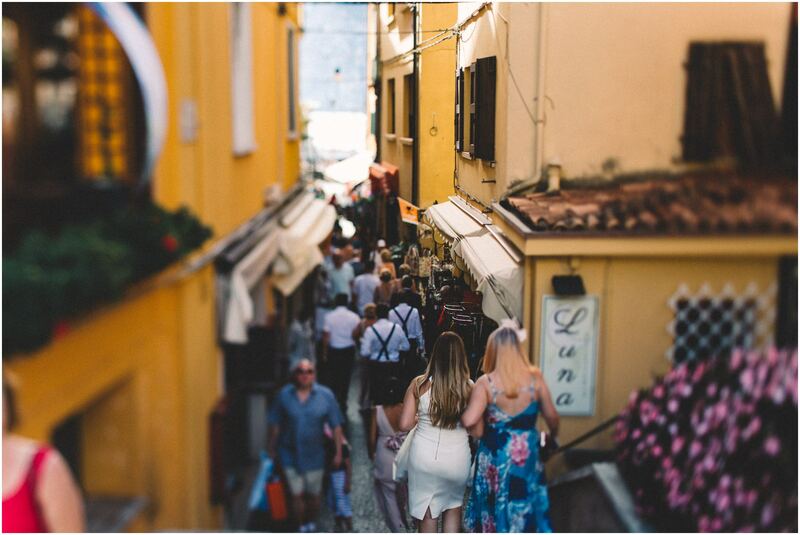 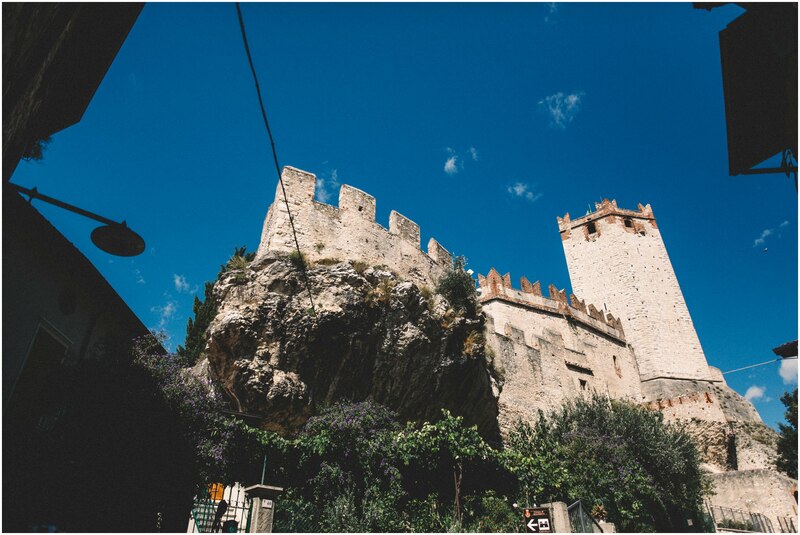 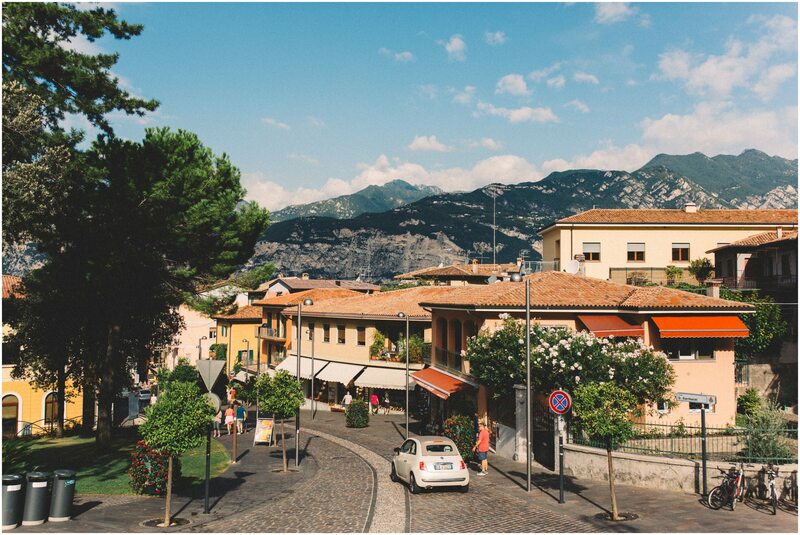 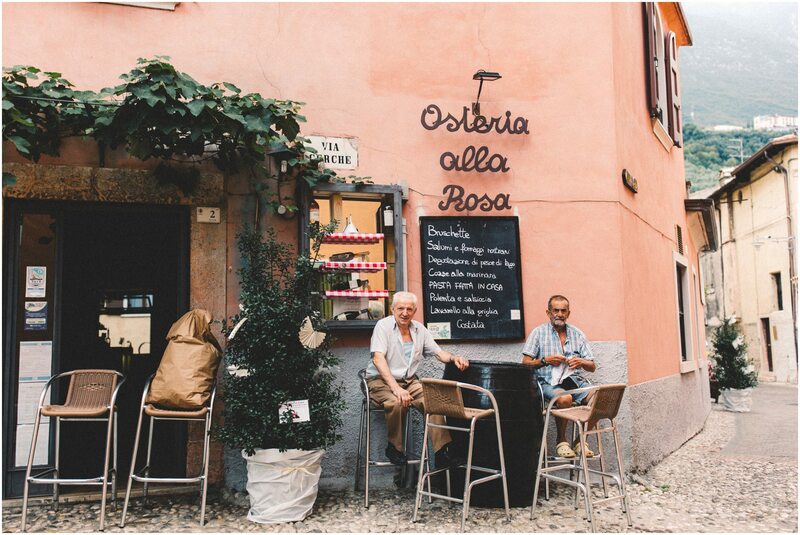 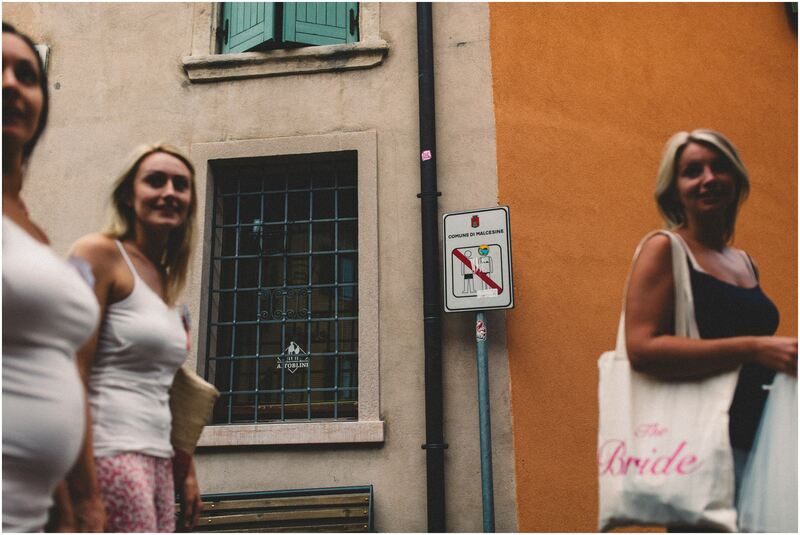 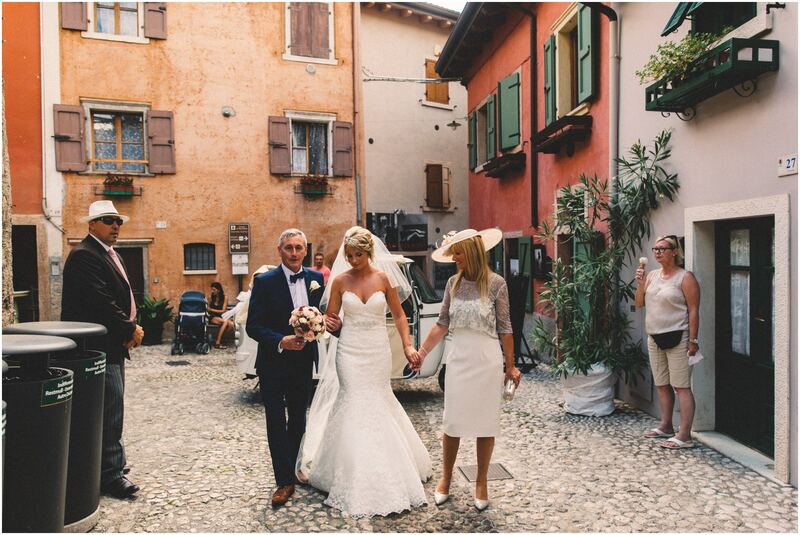 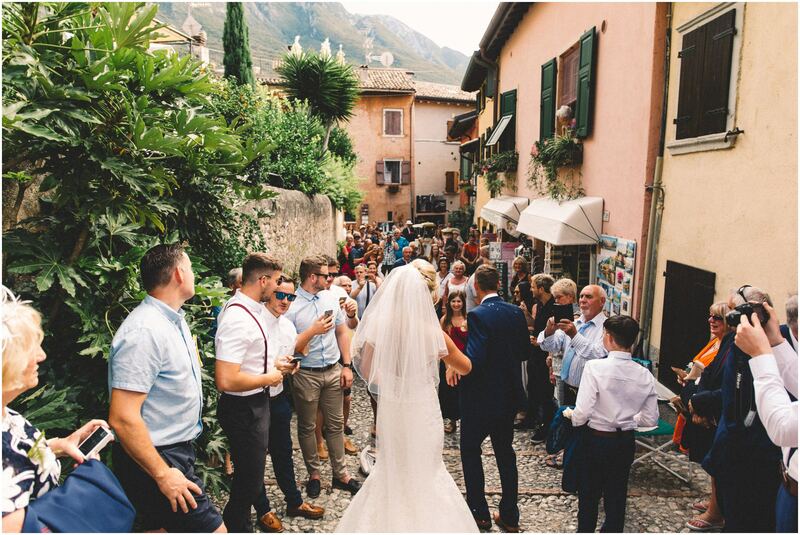 The day continued with a walk through the old cobblestone winding Italian streets but not before Alex and Paul appeared from the castle gates to their friends, family, tourists and even the local Italians clapping, cheering and shouting “bacio – kiss” – it was such a beautiful moment! 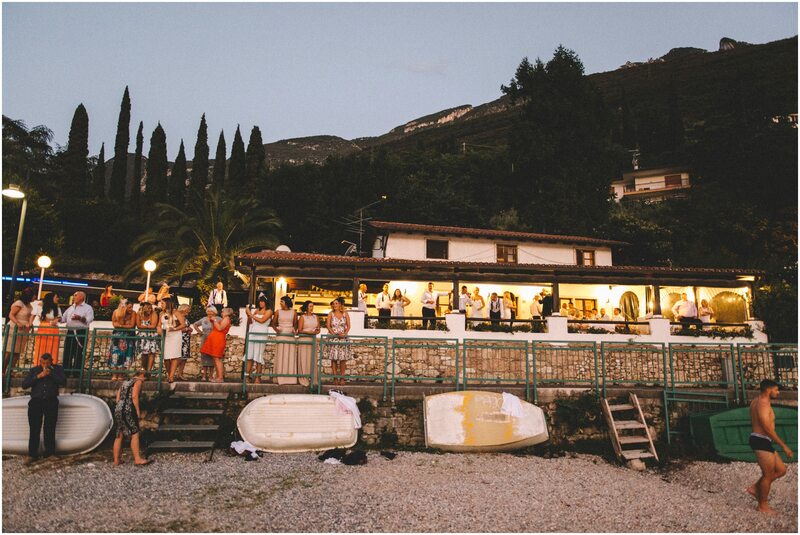 We reached the small harbor where we boarded a private boat for a drinks reception and trip around the lake, stunning! 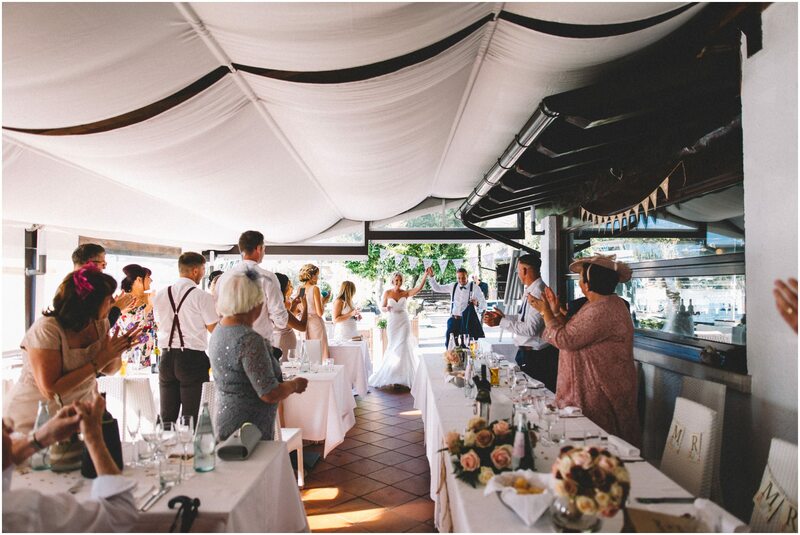 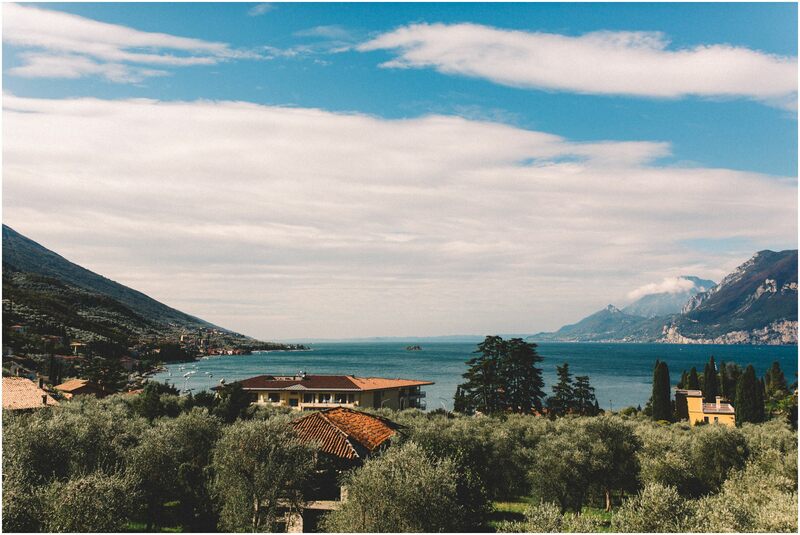 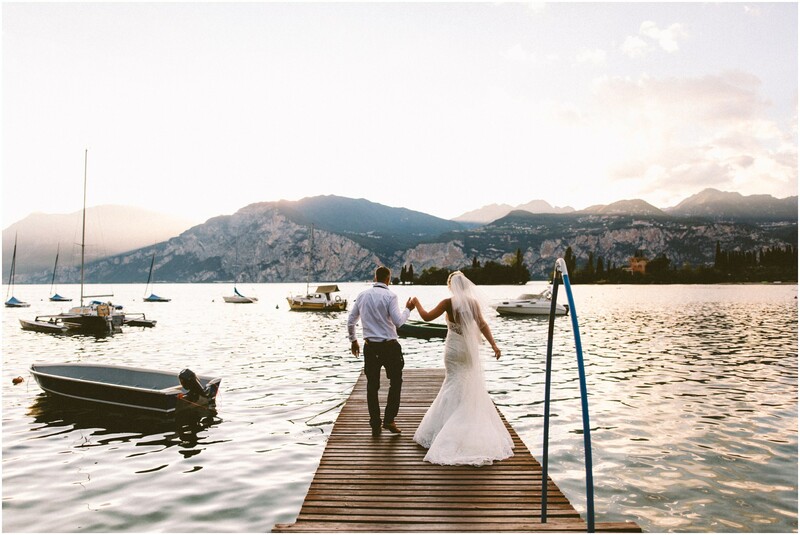 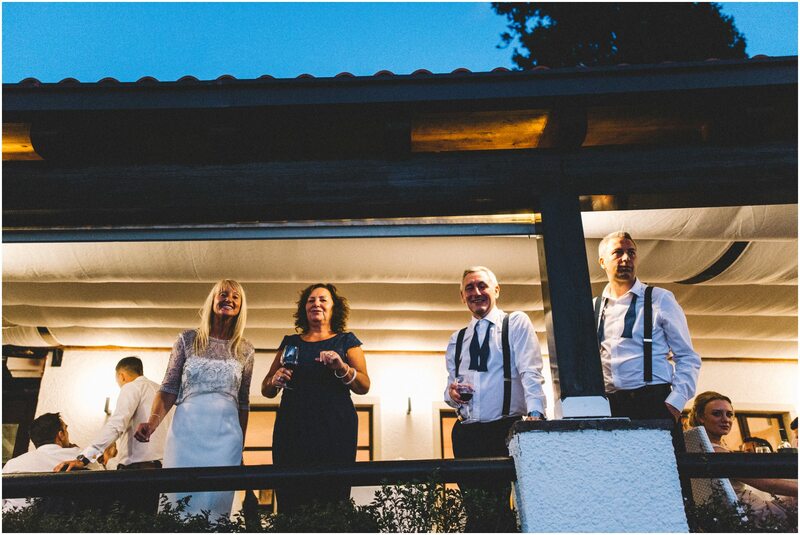 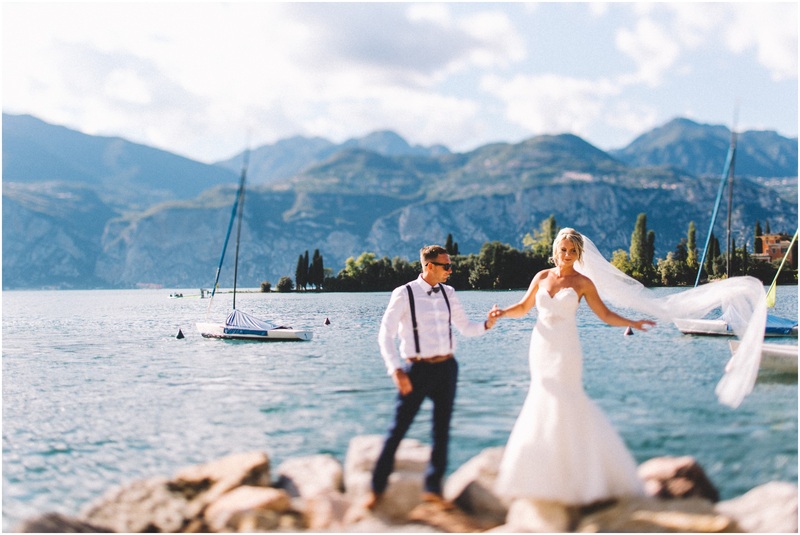 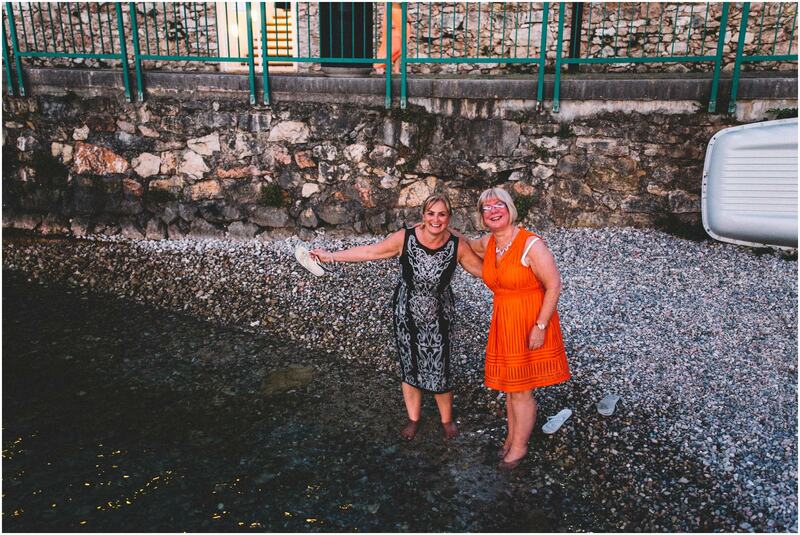 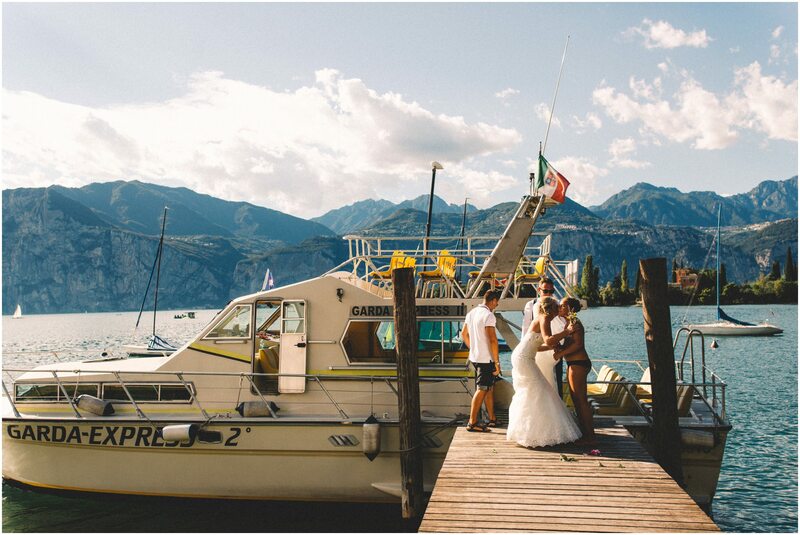 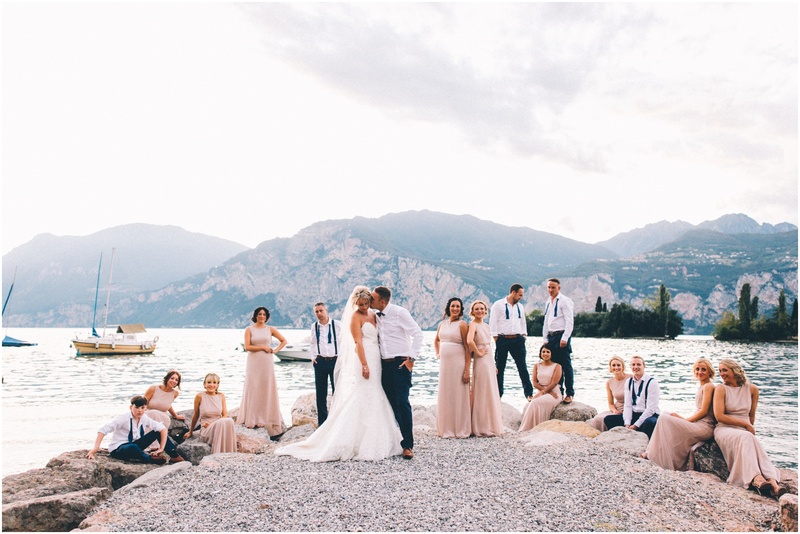 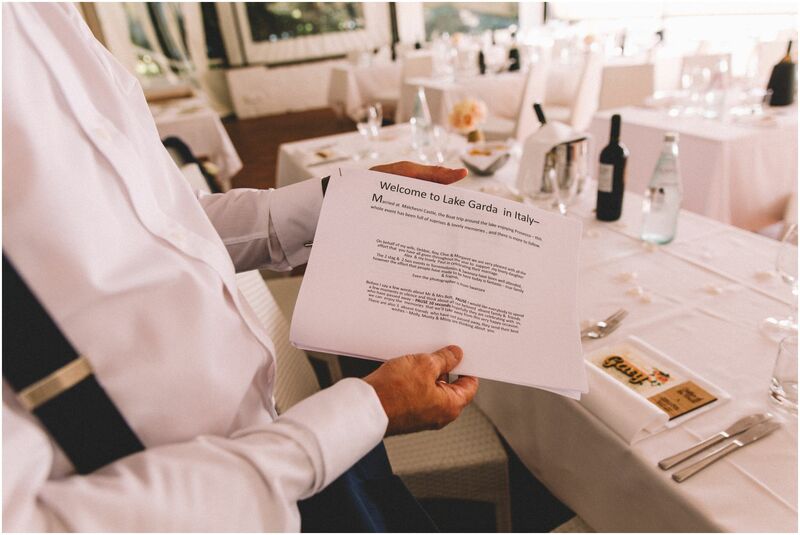 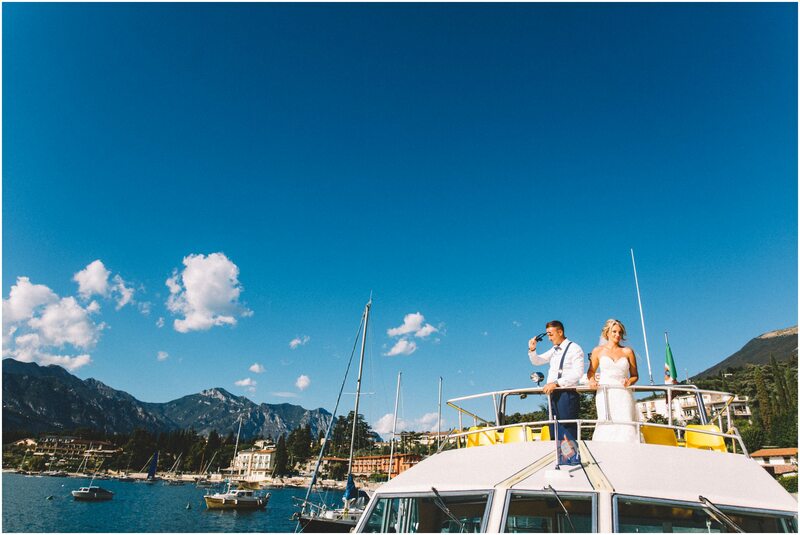 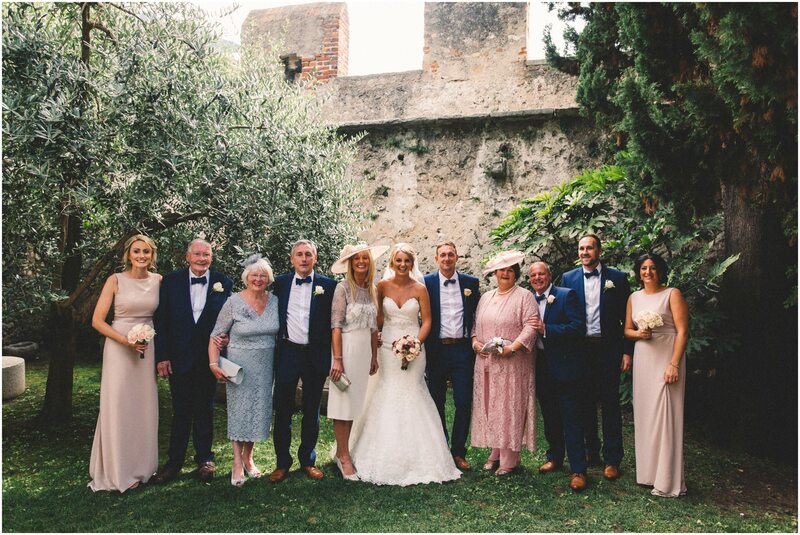 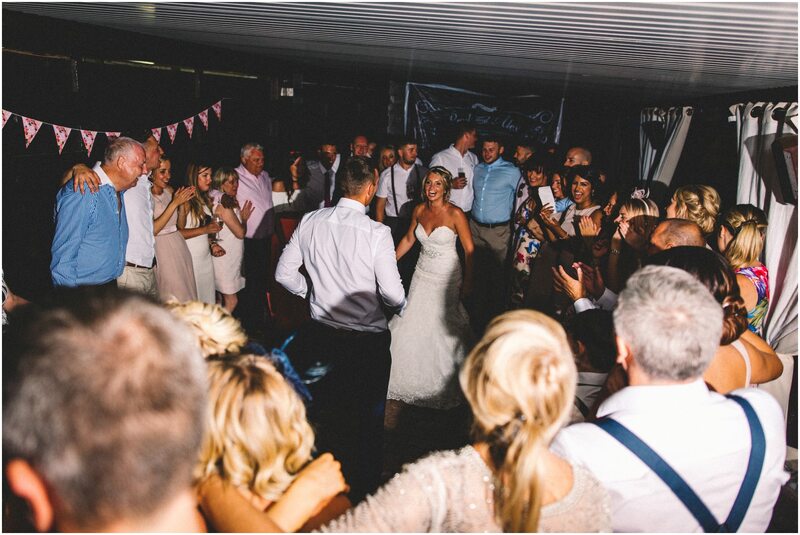 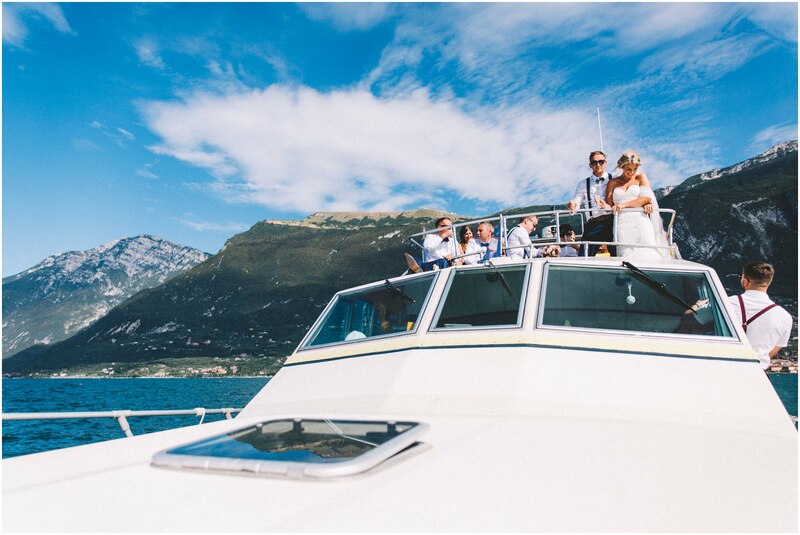 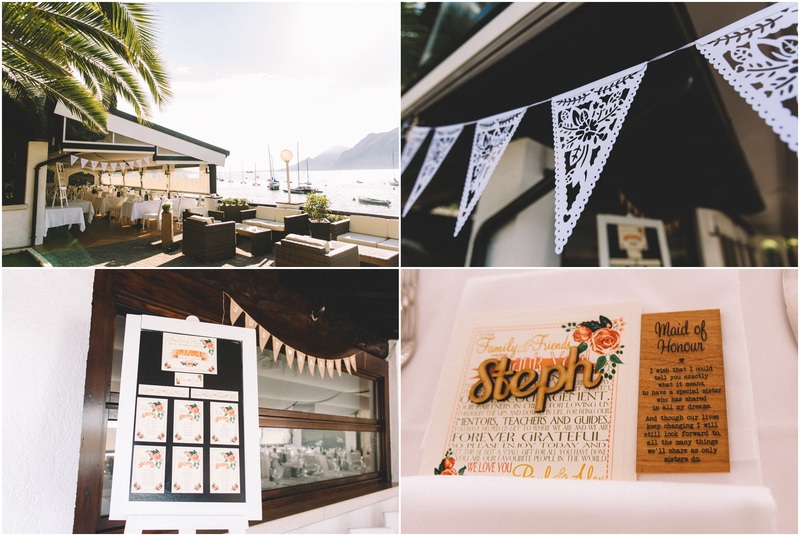 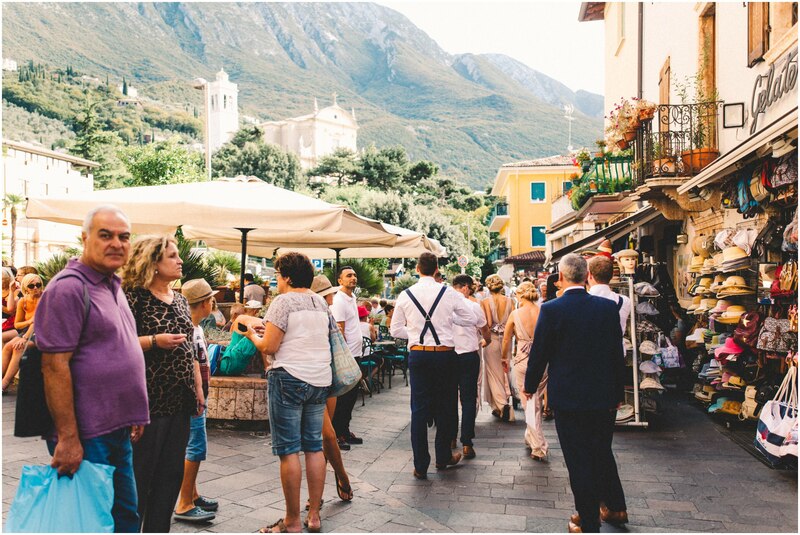 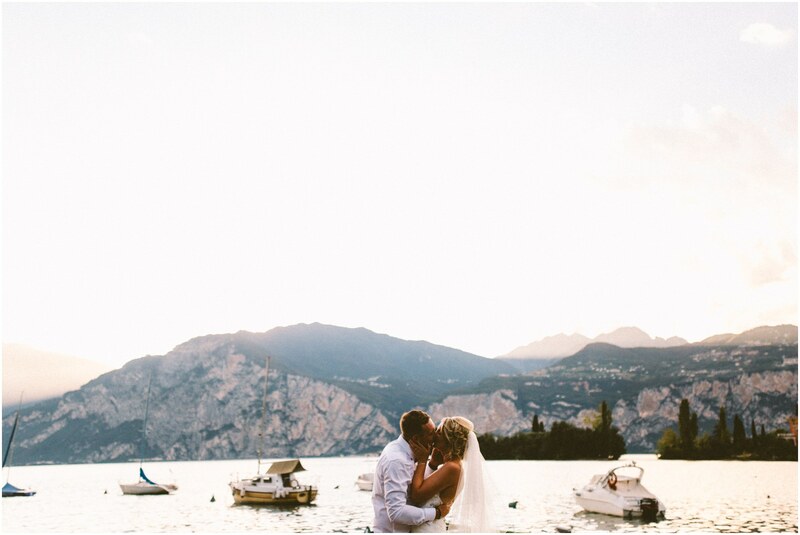 The reception was held at a beautiful venue on the shore of Lake Garda, the 60 friends and family that had flown over from the uk to join Alex and Paul enjoyed an amazing afternoon. 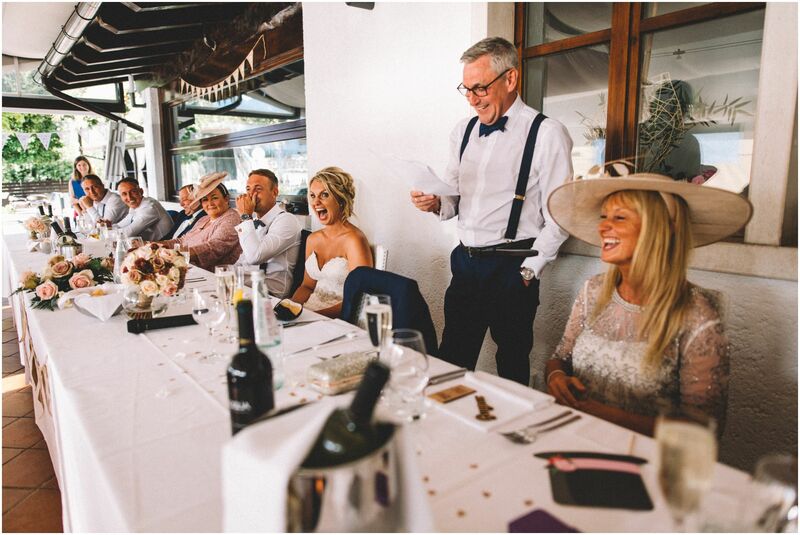 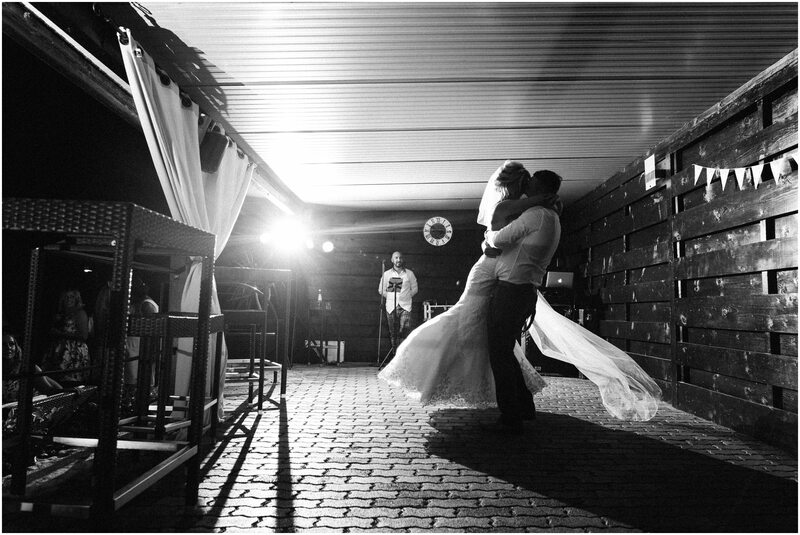 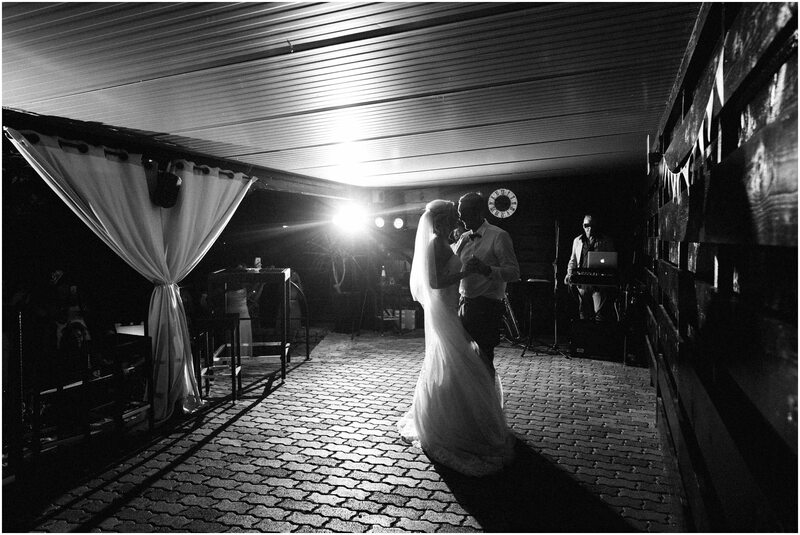 The speeches were filled with love, tears and laughter. 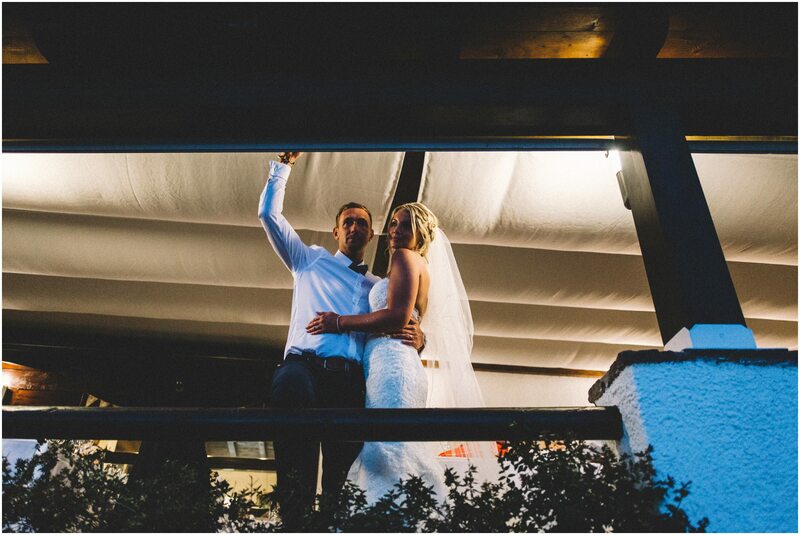 We honestly can’t describe well enough how loved these two newlyweds are, they have the most fantastic family and friends. 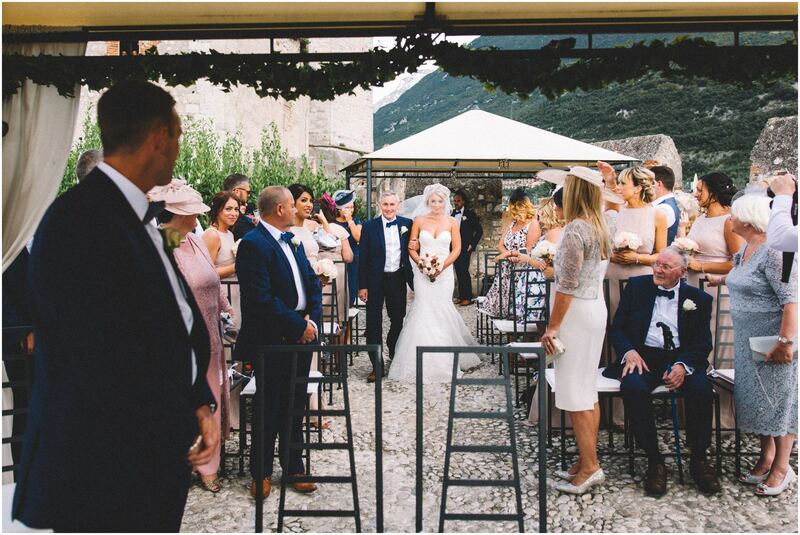 Everyone made us feel so welcome, exactly how Alex and Paul have treated us from the first day we met them, we are very grateful for this. 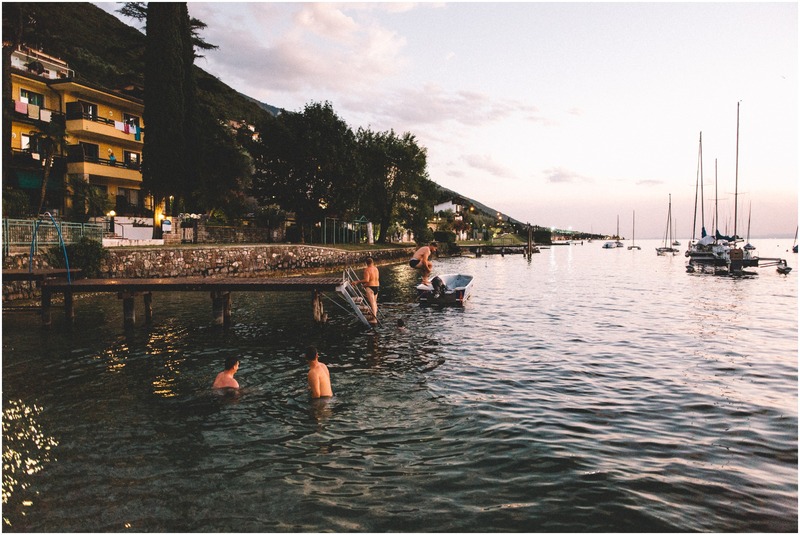 As the evening set in some guests decided on a spontaneous swim in the lake, Paul’s Dad even entertained us with a few pretty spectacular back flips off the jetty! 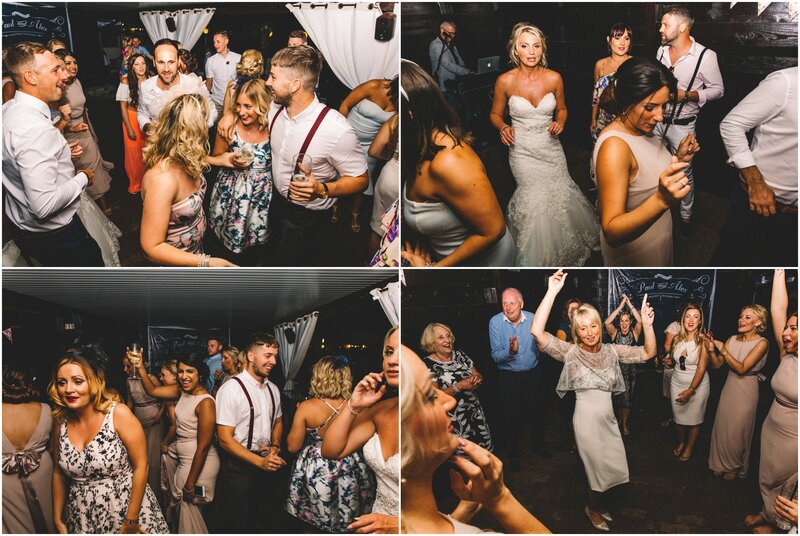 Night fell and the party got started, and this lot showed us that they love to party!! 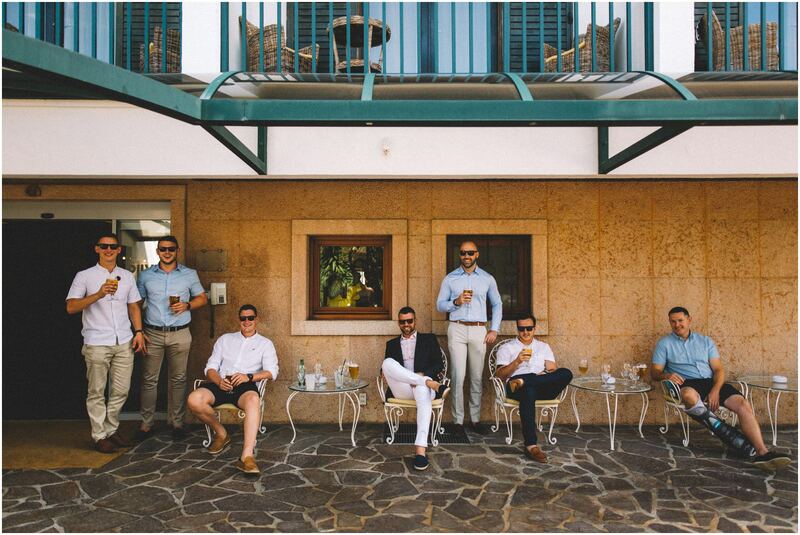 Not wanting the day to end we all joined Alex and Paul for a few cheeky nightcaps back at the hotel… and the rest as they say is history! 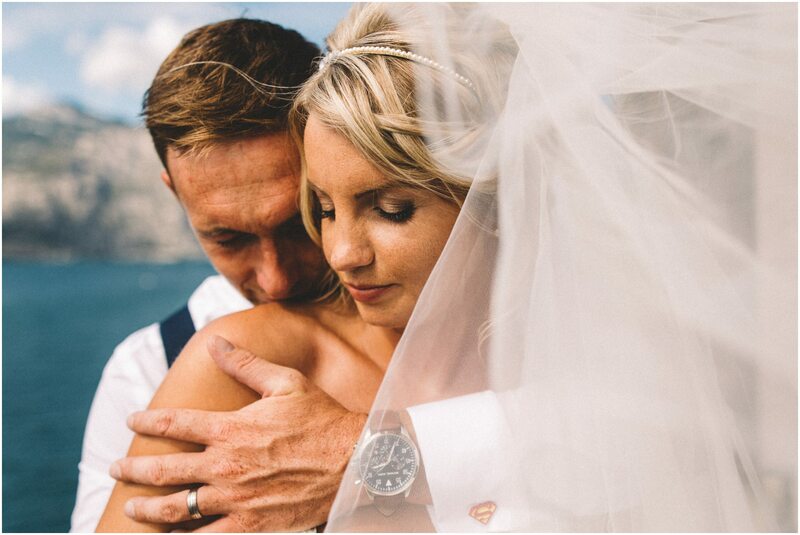 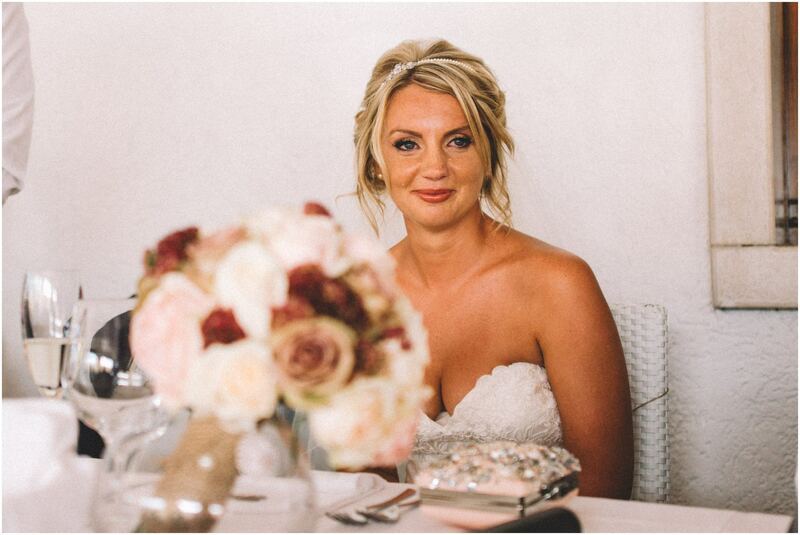 So our first destination wedding succeeded all the expectations we had, it blew us away just as our amazing Alex did to Paul with her beauty.